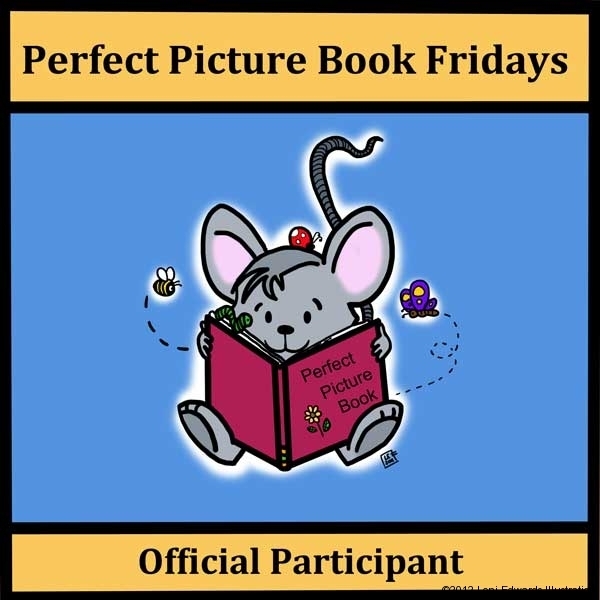 The 2012 Caldecott winner is my choice for Perfect Picture Book Friday! Synopsis: Daisy is a sweet little dog. She has a red ball that she loves. A trip to the park and fun with a friend ends in a sad thing happening. But, with the help her friend, Daisy overcomes her sadness. “Noteworthy for both its artistry and its child appeal.”- The Horn Book Magazine. I think that the best thing to do is take your own dog for a walk. Talk about the things that your dog likes to do. Play with a certain toy? What tricks does it do? What is your dog’s personality like? Why I like this book: I think for someone to create a picture book without words and do it well is just…amazing! Chris Raschka succeeds in telling a story with pictures that keeps the reader engaged and tied emotionally, page after page. His simple paintings are a delight. The message the book shares is one of friendship and love. The illustrations look really cute! It’s a good way to teach kids about disappointment. I’ll look for it. Thanks for your comment Erik! I’ll have to check this one out, looks perfect for my little ones. Thanks Loni for the review and links. Yes, it’s great for little ones. Very engaging. This is where I long to be an illustrator and to be able to show such a beautiful story with no words at all. Thanks, Loni! I would love to do a book like this! You’re welcome Joanna! Understand why it won a Caldecott. It sounds like a very beautiful book. And, one where kids will be able to talk about as they read. Yes, I saw a video on Youtube where a little girl was “reading” it to her grandma. It was great! We let the book engage us however. Sometimes its the kid, sometimes it is the mom 🙂 It actually allows for more conversation when there are no words. I think real little kids enjoy books like this because they have confidence as its an even playing field (since they can see and can’t read). Just my thoughts. I checked this book out from the library recently. It was darling. Great title for the list. Glad you liked it Penny. I was pleasantly surprised by it. His other book that he illustrated “The Hello Goodbye Window” is also excellent. The illustrations in this book are such a delight. We love it! Yes, I agree! Thanks for stopping by Kirsten! I really need to get this title. We’re a dog family. We love a good dog book with or without words. Oh you will love it! It’s so sweet! I love wordless books…not only for very young children. There is something very special for a child about being able to put their own voice to the illustrations. This is a wonderful message to share with kids…and the activities (especially yours) are great! Yes, I agree, it’s a wonderful message! I have yet to read this book. Since it won the Caldecott there’s a wait at the library! How great that you found different resources than Nessa did. (And I’m sorry I’m behind in updating the PPB master list! Gotta catch up!) I love dogs, so dog books always appeal to me. And, like you, I’m so impressed by any book that can tell a story with no words at all, or even just a very few like in Good Dog, Carl. Thanks for sharing this lovely title! Oops! Another title that was already on the list? Yikes! Sorry Susanna. Oh well, glad I had different resources. 🙂 Thanks for the comment! I may have to find this one just because we have a dog named Daisy! Who is snoring on the couch next to me. Thanks, Loni! Heather, you will love this book! This looks like a terrific book. I bet that kids would have fun making up their own words to go with it. How original of a choice!